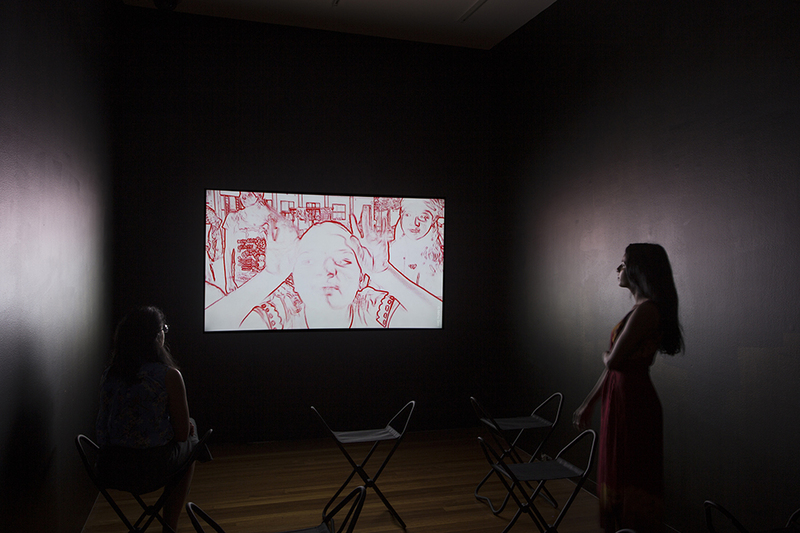 Mithu Sen 'I have only one language; it is not mine' (2014) Video installation based on a performance. Photo: Tobias Titz, RMIT Gallery, 2016. 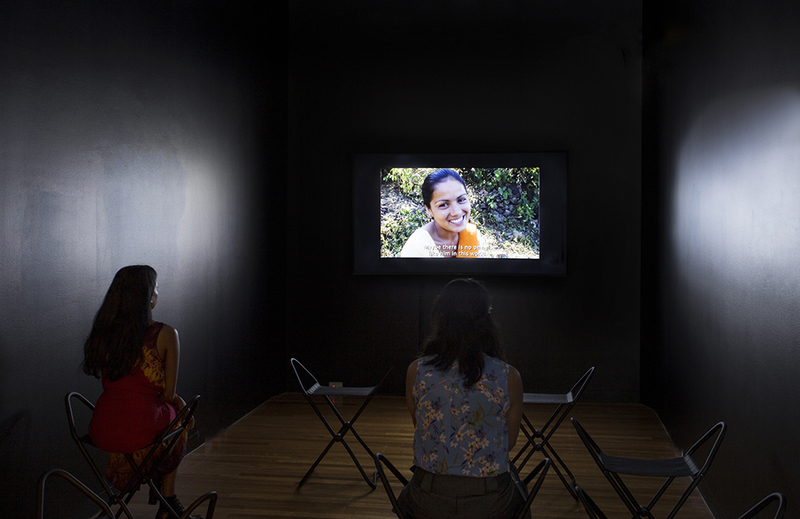 Pushpa Rawat and Anupama Srinivasan 'Nirnay' (2012). Photo: Tobias Titz, RMIT Gallery, 2016. These two works of art by Mithu Sen and Pushpa Rawat poetically address issues women face with obligation, patriarchy and the inter-generational dynamic. 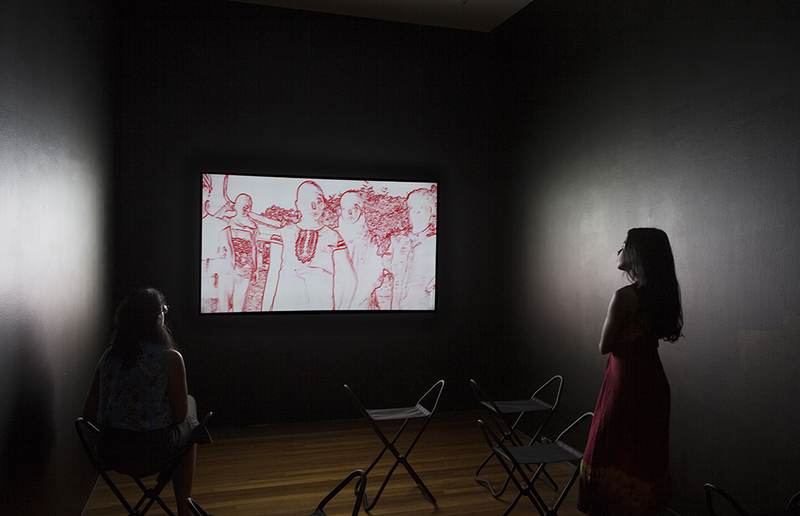 New Delhi–based artist Mithu Sen is an influential and prominent figure on the contemporary Indian art scene. 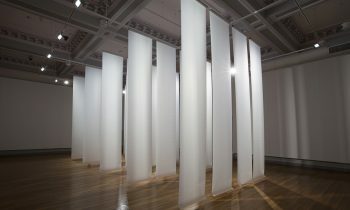 Her drawings, sculptures, and installations push the limits of acceptable artistic language and subject matter. Sen obtained her BA and MFA in painting from Kala Bhavan at Santiniketan, and later, completed a postgraduate program at the Glasgow School of Art on the prestigious Charles Wallace India Trust Award for 2000-2001. For her multi-media installation I have only one language; it is not mine renowned Delhi-based artist Mithu Sen spent time at a Kerala orphanage for marginalised young girls who are victims of sexual and emotional abuse. 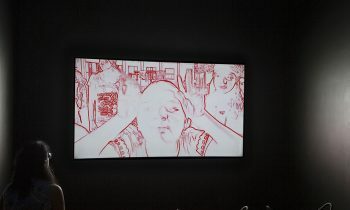 For this project Sen interacted with children as her alter-identity “Mago” – a seemingly displaced person in a state of transit with no recognisable verbal communication, who does not understand the concept of time. Sen placed her character in the situation as if she and the children themselves were all fictional, yet the situation, circumstances and future of these children is a genuine issue. Pushpa Rawat lives in Ghaziabad, Uttar Pradesh, a large industrial city close to Delhi and has an MA in Philosophy and works as a freelance photographer. She was one of the filmmakers of the 2007 acclaimed short documentary Kyon, a group project that was shown at many film festivals and workshops. Nirnay (Decision) the debut film of director Pushpa Rawat, is set on the outskirts of Delhi, and explores Pushpa’s life journey and that of her young, educated female friends. These women feel powerlessly obligated when it comes to taking any major decision regarding their future be it career or marriage. Filmed over three years, the documentary shares the young women’s daily struggles and negotiations with their families as they search for their true voice. In fearlessly questioning society’s expectations of young women, the film explores whether they have a say in the most important decisions in their lives, or whether they are afraid to make some choices.